Prior to being diagnosed with cancer at age 12, Hannah was a huge athlete – swimming, track, and volleyball. But frequent headaches lead to a diagnosis of a tennis ball-sized brain tumor. 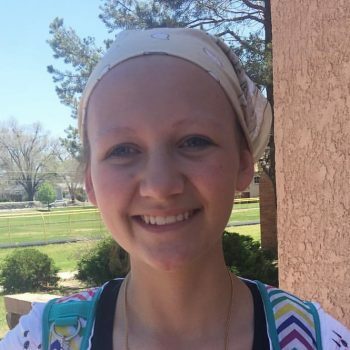 Surgery, 31 radiation treatments, and 6 months of chemo followed as Hannah took on the toughest opponent of her life. Hannah is doing great now, and her competitive spirit is still strong. While her cancer and treatments left her legally blind in one eye, she does not let that slow her down. She is back to living life with gusto and we all have faith she’ll be a winner at whatever she takes on. Dr. Rajeev Vibhakar and his team used a microarray chip (funded by a grant from The Morgan Adams Foundation) to determine that Hannah had a “good” type of medulloblastoma. That meant less therapy and fewer side effects for Hannah. Everything they learned from Hannah’s experience will also help treat more kids with similar conditions and move hope forward for a better quality of life for survivors.